Like The Bright Side? Click here to view the entire range. 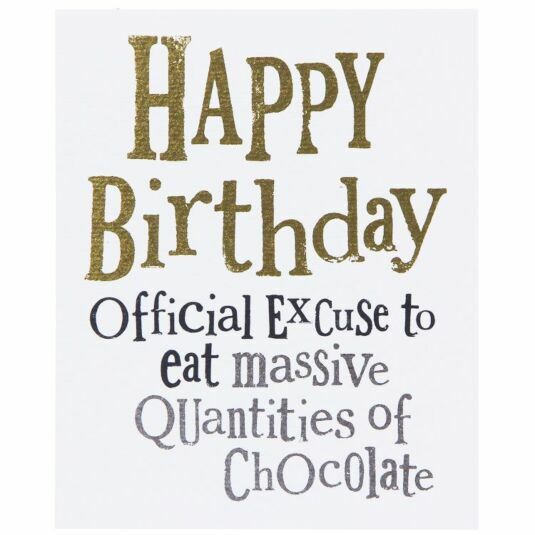 Honour a friend or loved ones birthday with the truest of birthday traditions with this fun and quirky card from The Bright Side. This card is blank for your own personal message. The Bright Side cards are an absolutely gorgeous range of bold, cleverly worded cards designed from old print blocks finished with shimmery coloured foil. Whatever the occasion, The Bright Side cards seem to capture its essence! The card measures 14.5cm x 17.5cm and comes with a white gently textured envelope. Writer, illustrator and self-declared eternal optimist Rachel Bright is the creative mind behind The Bright Side. Her work aims to capture a free way of thinking - one that makes you feel anything is possible - a sentiment all too easily lost with the end of childhood. Her bold designs feature across a whole range of products – everything from wedding planners to egg cups – as Rachel aims to bring the brighter side of things to all aspects of life. The distinctive Bright Side font adorns all of her pieces, making it instantly recognisable as well as evoking the freewheeling spirit the brand stands for. Sometimes tongue in cheek, often bold and quirky, and always with a positive outlook, the Bright Side is a truly unique gift to the world. As well as her work with the Bright Side, Rachel has written several acclaimed children's books, all of which can be found here on CampusGifts. She also writes poetry and was the official World Book Day illustrator in 2013. Rachel kindly agreed to speak to us about her work with the Bright Side and beyond, and you can read the full interview here!